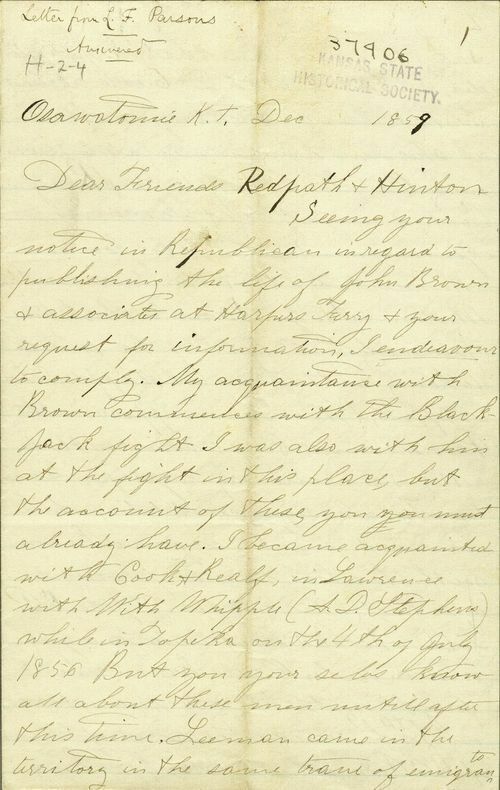 Parsons, "a soldier under John Brown" in Kansas, who fought in the battles of Black Jack and Osawatomie (see, Twenty-fifth Biennial Report, KSHS, 135-136), wrote this letter from Osawatomie to James Redpath and Richard J. Hinton in response to their "notice in the Republican in regard to publishing the life of John Brown & associates at Harpers Ferry & your request for information." In addition to his Kansas activities, Parsons was with Brown and company in Iowa during the winter of 1857-58 and mentions, as did Kagi and others, the "Lyceums" conducted by Brown around their evening campfires and the "thorough course of military instruction under Col. Whipple as Drillmaster." Parsons, who was obviously proud of his association with Brown, apparently just missed being in on the Harpers Ferry raid--he had returned to KT during the long wait and was not recalled.